Klezmer music and dance is a joyous reflection of life in pre-WWII Eastern European Jewish communities. Come learn this fun dance tradition, and you can be ready for your next Jewish wedding or Bar/Bat Mitzvah! No experience and no partner needed! 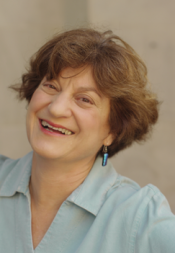 Yael Schy has been teaching many forms of folk dance and social partner dance for over 40 years. She is a regular teacher at Lark World Music and Dance Camp, as well as at the SF Free Folk Festival.